Astrophysicists from the University of Birmingham have captured the sounds of some of the oldest stars in our galaxy, the Milky Way, according to research published today in the Royal Astronomical Society journal Monthly Notices. 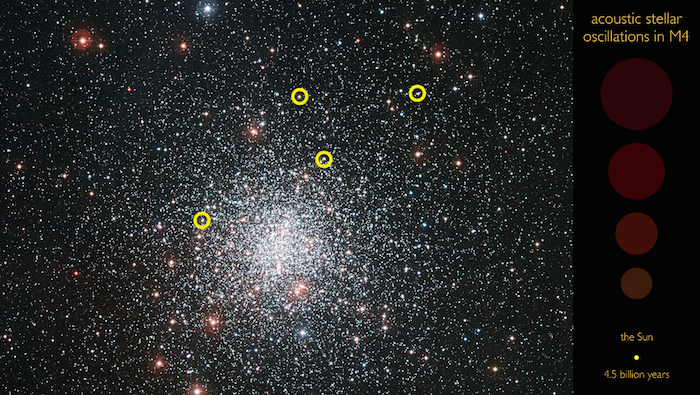 The research team, from the University of Birmingham’s School of Physics and Astronomy, has reported the detection of resonant acoustic oscillations of stars in ‘M4’, one of the oldest known clusters of stars in the Galaxy, some 13 billion years old. Using data from the NASA Kepler/K2 mission, the team has studied the resonant oscillations of stars using a technique called asteroseismology. These oscillations lead to miniscule changes or pulses in brightness, and are caused by sound trapped inside the stars. By measuring the tones in this ‘stellar music’, it is possible to determine the mass and age of individual stars. This discovery opens the door to using asteroseismology to study the very early history of our Galaxy. The paper is entitled: ‘Detection of solar-like oscillations in relics of the Milky Way: asteroseismology of K giants in M4 using data from the NASA K2 mission’ and is published by the Royal Astronomical Society in Monthly Notices.